The Georgia Tech football facility is the oldest in Division I and was host to its first collegiate games before World War I. A few years later, John Heisman led the program to its first of four national championships. The newly-renovated, 8,100 sq. 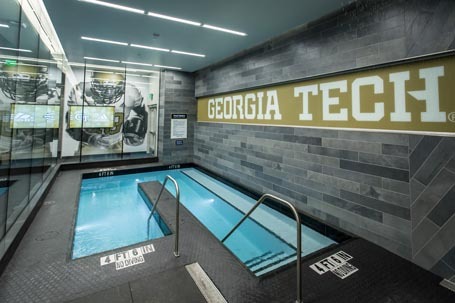 ft. football team’s locker room, located at Bobby Dodd Stadium at historic Grant Field, looked to honor the past history of the program with an eye to the future. The new locker rooms include a large focal feature on the ceiling for the team to gather around, 116 ventilated lockers each with a 15-inch digital video screen that can be used as a nameplate or to display highlights, sleek interior finishes, adjustable lighting, upgraded MEP/FP systems, as well as new sinks, toilets, and showers. The trademark GT hexagonal pattern is expressed throughout the design tying the lockers, ceiling feature, graphics, and even the tile accenting around the spas into a cohesive and consistent branding element. 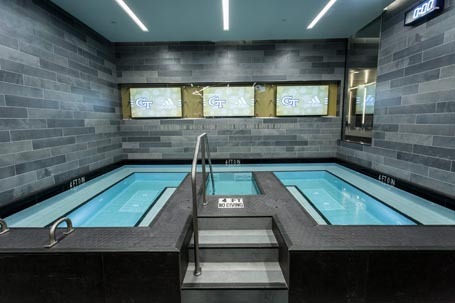 A unique focal point within the locker room is the new hydrotherapy area that consists of two new in-ground, custom plunge spas. The 180 sq. ft. cold spa, capable of holding 18 people will be utilized primarily during post-workout recovery and includes an underwater bench. The 200 sq. ft. hot spa, capable of accommodating 11 people, provides bench seating around the full perimeter with hydrotherapy jets. Adjacent to the plunge spas is a fully-immersive rain shower with LED lights allowing players to rinse off following workout. As with any project that is working on an existing site over 100 years old, there are many challenges with existing conditions. For example, once excavation began for the spas, the old campus pool was discovered several feet deep with the existing interior tile finishes and much of the structure still in place. This pool was infamous to Georgia Tech and alumni as every student from 1940 to 1987 was required to pass a “drown-proofing” survival class.